The word bankster, a negative term for (especially big) bankers, has gotten really common since the major bank bailout. (Today, it gets 2.24 million raw google hits.) But it's not THAT established ... OED Online doesn't have it. It was interesting, I thought, to see the old -ster suffix being productive in the current scene. It used to be highly productive and we still have lots of examples around and not all really old. I had just uncritically reckoned that it was that suffix, with the negative semantics probably by association to terms like huckster, gangster, shyster, and so on. But in UrbanDictionary and other sources, it's treated as a blend of banker and gangster. Not sure I buy that. Anybody got any info or arguments on this? 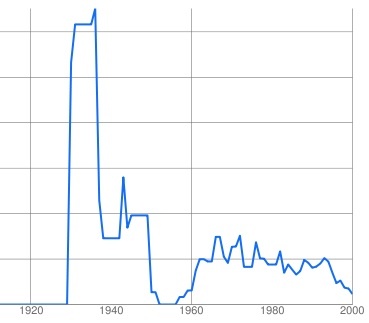 The sharp rise might be consistent with it being coined in the media or something. Appropriate that it's come back now, eh? Anyway, I'd be curious if others know more about this one. This is the first time I've seen the term "bankster," but I would pronounce it identically to "gangster" except for the first syllable (I insert a [k] between the velar nasal and s in "gangster"), so the connection sounds plausible to me. That should read "except for the first SEGMENT!" It's perhaps notable that bankster and gangster are near rhymes. I'm thinking it could be both. And I think that the similarity in to gangster certainly makes it read as a blend, regardless of origin.